Enough has been said about Jigarthanda already, the movie has enjoyed a dream run at the box-office so far and will still hold a fair number of shows in Chennai city in the coming week's schedule, in-spite of Anjaan's massive release. Jigarthanda has also earned the status of a cult film and has been praised by the entire film fraternity including giant directors like Shankar and Mani Ratnam. 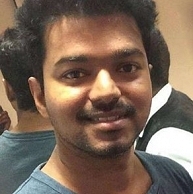 The latest to praise the movie is Ilayathalapathy Vijay. It seems he personally called director Karthik Subbaraj and said that he enjoyed every bit of the movie. The Jigarthanda team have yet another reason to rejoice now. Suriya, Vidyut and Yuvan leave for…. It's official ... Jyothika is Back !!! When is 'Thala 55' expected to release? Karthi repeats his blockbuster sentiment ! Evergreen beauty Sridevi is getting greener. What Mani Ratnam Felt About Jigarthanda? Ilayathalapathy Vijay To Mark His Presence In 'The Next Superstar' Event! Jigarthanda Movie – Its Ding Dong Film!! People looking for online information on Ilayathalapathy Vijay, Jigarthanda, Karthik Subbaraj will find this news story useful.